China has accused some United States exporters of supplying tainted soya bean crops. Chinese officials said potentially harmful "weeds and contaminated dirt" had been found in the beans, but made no mention of any import restrictions. China has recently been at the centre of concerns about the safety of some of its own exports, including toothpaste, pet food and, in the latest case, toys. 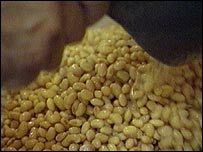 US soya bean exporters said China was trying to "balance things out". The Chinese authorities said the contaminated beans could be harmful to consumers and called on the US to take effective measures to deal with the problem. The US is one of the leading exporters of soya beans to China. Chinese officials said supervision of bean quality would be stepped up but made no mention of any plans to restrict imports. Last month, China suspended some US meat imports, citing safety fears. Phillip Laney of the American Soybean Association told the Reuters news agency: "[Chinese government officials] are just scrambling around to find some quality problems from shipments from the US to balance the thing out." In 2004, the China soya industry suffered badly when Brazilian cargoes were halted on quality issues. Analysts say concerns over China's own harvest and rising inflation mean a US import ban is unlikely. Last week China said it would send delegations to the US to discuss safety concerns, after the spate of recalls of food and other products. US toymaker Mattel had recalled more than 18 million China-made toys after finding that the paint used might contain lead. In two of the other most serious cases, a number of deaths in Panama were linked to tainted cough syrup while a number of cats and dogs in the US were killed by contaminated wheat protein in pet food.